Larson Tool continues to support innovative initiatives with both large and small businesses. We are now involved in the production of the Kuma™ spork, a compact and reusable utensil conceptualized and designed by Micah Baclig (pictured here). 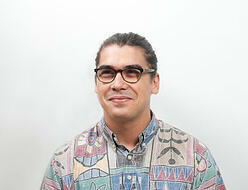 Micah was born and raised in Kailua, Hawai’i. He is currently a freelance designer based out of Providence, RI, and a graduate of the industrial design program at the Rhode Island School of Design (BFA, ID 2014). He approached Larson Tool via the website. We are thrilled to be assisting him in finding the right tools and stamp for his vision. Kuma™ is a compact spork that fits in your pocket or the palm of your hand. 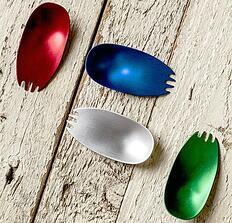 Micah designed the utensil to be a convenient alternative to disposable cutlery that is often thrown out after one use. The Kuma™ spork is the perfect companion for your camping trips, packed lunches, or that tasty food truck treat just around the corner. Our diverse capabilities enable us to design, manufacture, and support global companies with forming, precision metal stamping, deep draw stamping, assembly, brazing, painting, and coining, and our nimble and receptive approach provides guidance and innovation to smaller companies, helping them grow into larger markets, such as Micah and his Kickstarter project. Because Micah is new to the design and manufacturing world, he had many questions that weren’t necessarily being answered as he prospected for a precision metal stamping supplier. We recognized that Micah’s situation was unique, and we took on the role as mentors, educating and encouraging him as we collaborated with him through the process. We spent more time with him because, as the head of a new start-up, he needed the extra guidance we could offer. We also helped him find supplemental suppliers and provided recommendations based on our extensive connections and relationships with other vendors. Continuing on the path of collaborative innovation, we work with companies of all sizes, providing guidance and cost-effective, high-quality results with everything from precision metal stamping and forming to deep draw stamping. 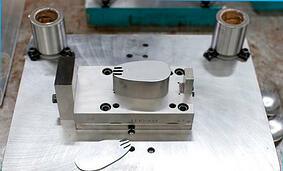 A fortune 100 company recently reached out to Larson Tool & Stamping Company for help in transitioning a product line. Check out our case study, “Deep Draw Stamping: How a Quality Precision Metal Stamping Supplier Delivers,” to see how we can help you with your next project. Download it now!